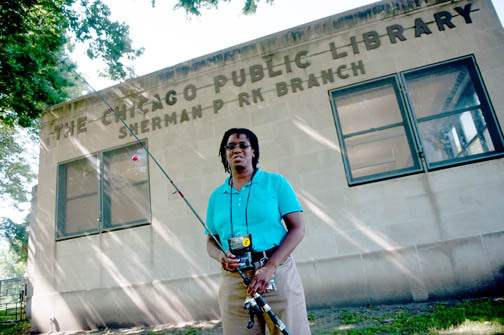 Nine of the 79 Chicago Public Library branches offer fishing poles for check-out. You can check out sculptures at the Aurora Public Library for eight weeks at a time. In an effort to keep up with the YouTube age, Skokie Public Library has a green screen available for checkout. Shanlie Ann Stead says she’s had a lifelong love of libraries and, as she recollects it, she personally experienced how far that love could go — straight from a library to her own apartment’s walls. Shanlie took the library up on the offer. Well, we talked to staff at dozens of area libraries and posed them your very question, which led many librarians to talk about what role the public library plays for all of us today. You can see this principle across our area’s libraries. Take the one in Orland Park, which is set to unveil a collection of nearly 200 artifacts from NASA on Sept. 15. The Waukegan Public Library recently inherited the personal library of native son Ray Bradbury. Of course, several librarians brought attention to their e-books and devices like the Nook, which would allow the contents of a basic book to be read in a digital format. Nonetheless, the three most curious and surprising things we found available to take home from local libraries are physical — not digital — objects. In their own way, these objects can be used to impart knowledge in library patrons, just like books. Unsurprisingly, the nine branches are close to the fishing waters of Lake Michigan, the Chicago River or lagoons. “It’s important because people who are normally in the inner city don’t normally get an opportunity to go fish,” said Lala Rodgers, who manages the Sherman Park branch, where 30 poles can be taken out on loan. Just like most materials, poles can be checked out for three weeks at a time. The poles can be checked out of the following branches: Albany Park, Blackstone, Douglass, Hegewisch, Humboldt Park, McKinley Park, Rogers Park, Sherman Park and Uptown. The Aurora Public Library had spent decades building a catalog of art (all copies, not originals), but for the past dozen years or so, it’s been disbanding it. Life goes on, though, for the library’s 30 sculptures, almost all of which cost less than $100. They’re still available for checking out for eight weeks at a time. Becky Tatar, the library’s audiovisual head, chose the collection based on what she thinks would interest her patrons, both from an aesthetic and educational standpoint. The sculptures used to be a popular option to spruce up office spaces back in the 1990s. But the sculptures aren’t checked out very often anymore. Tatar says just one item — an angel holding two vases, a copy of a 14th century French original — has been checked out multiple times this year. Other sculptures include busts of Martin Luther King Jr., Beethoven and the University of Illinois’ Chief Illiniwek. There’s also a miniature edition of Rodin’s The Thinker. The Skokie’s Public Library’s digital media lab is outfitted with the latest tech, from computers to drawing tablets to guitars that patrons can use for their creative needs. "It is a really awesome place because it&apos;s a place where people can create knowledge," said Mick Jacobsen, who oversees the lab. "We create a space where people can use really great computers, really great equipment, really great software and create some amazing media." Much of that gear can’t be checked out due to licensing arrangements, but there among the items you can walk out with are: hard drives, audio recorders and simple video cameras. 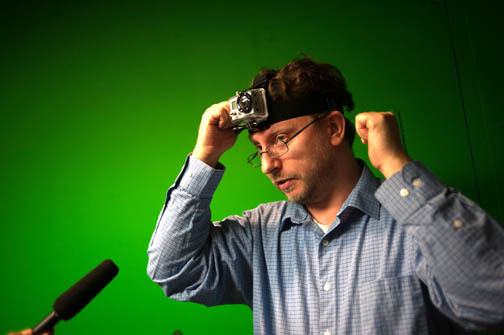 The latter include the GoPro, which can be attached to a person’s head or body for action shots. But perhaps the oddest thing that can be taken home from this lab is the green screen, which costs no more than $80. Jacobsen said in the age of YouTube, his library is stepping into the role of “community access television” by giving patrons equipment they might otherwise use at most twice in their lives. Asked if patrons find a library offering this kind of equipment on loan as “weird,” Jacobsen replied: "Weird is not really what they say. It&apos;s more surprise like &apos;Really?&apos; We are just branded books and that&apos;s just the way we are seen." How did Shanlie take this? After getting a preview of our list, Shanlie Ann Stead called the idea of public libraries stocking sculptures as "cool" and fishing poles as "romantic." She also recognized the significance of libraries like Skokie moving to offer equipment like green screens for media production. “I find that very progressive. Personally I think that was a really great thing for them considering the age of technology we live in,” she said. “Compare that to a fishing pole. There&apos;s a lot of area in between there." At the Joliet Public Library, two American Girl dolls, Addy and Josefina, are hot items. At the Waukegan Public Library, people can check out 3D puzzles. Video games are available at various libraries including Libertyville’s Cook Memorial Public Library and in Aurora. Though Aurora has disbanded its art print collection, the Des Plaines Public Library still lends out similar art. Aurora also has about 20 file cabinets of sheet music. Skokie lends out animal puppets to go along with certain children’s books. Along the lines of creation at the public library, Chicago’s Harold Washington Library Center recently became home to a "maker lab," which allows those taking classes to use software to create objects using 3D printers and computerized wood carving machines. Did we miss anything Shanlie Ann Stead should know about? Drop a comment below if you’ve checked out something notable from a Chicago area library. What was it? Where did you check it out from? When?